The Home Secretary has praised the work of the Ahmadiyya Muslim community in fighting extremism across the UK. 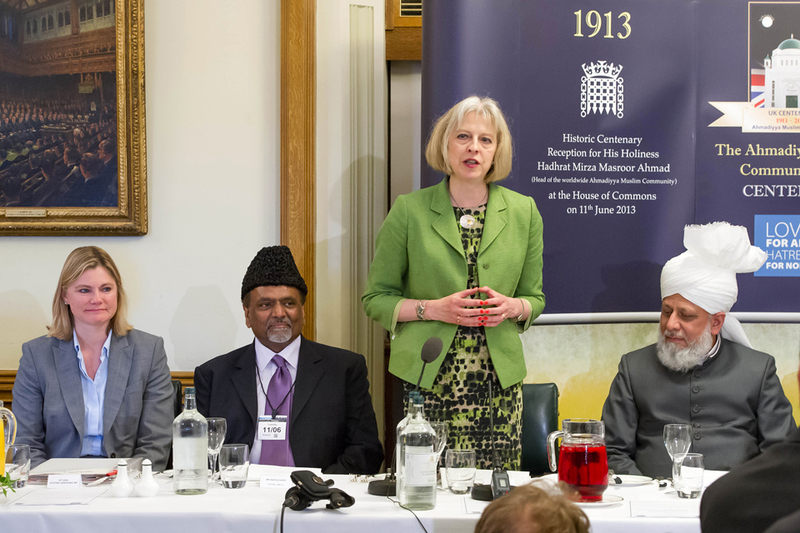 Home Secretary Theresa May praised the work of the Ahmadiyya Muslim Association at an event marking its hundredth year in the UK. Speaking in the House of Commons on Tuesday (11 June), the Home Secretary said the organisation’s philosophy of ‘Love for All and Hatred for None’ was exemplified by its condemnation of the horrific murder of Drummer Lee Rigby in Woolwich. Extremism cannot and will not be part of Britain so long as we remain an open and tolerant society. I have no doubt that together we shall defeat the extremists. You have shown, and continue to show, that the only effective way of persuading them out of their poisonous convictions is peaceful dialogue. Also speaking at the event was the Ahmadiyya Muslim’s spritiual leader, His Holiness Hadhrat Mirza Masroor Ahmad, the Deputy Prime Minister Nick Clegg, and Energy Secretary Ed Davey. I want to praise the great qualities of open-heartedness and tolerance exhibited by the British people, for the way in which they have accepted immigrants as members of the country and allowed them to become a part of the fabric of British society. If a person’s heart desires then they are free to accept Islam, but if their heart does not, then they are free to reject it. Therefore, Islam is completely against compulsion and extremism; rather, it advocates peace and harmony at all levels of society. Share the post "Extremism has no place in ‘open and tolerant’ Britain"